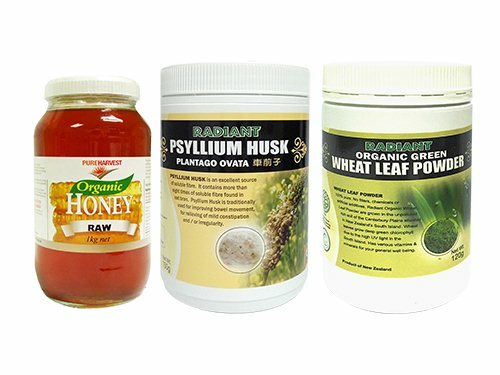 Set consists of 1kg Pure Harvest Raw Honey, 150g Radiant 99% Pure Whole Psyllium Husk and 120g Radiant Organic Wheat Leaf Powder. Pure Harvest certified organic honey is full flavoured natural sweetener. This honey, has not been heated above 45°C, thus preserving the honey’s antioxidant, enzymes and vitamins. Can be used as a natural sweetener for drinks, cooking, sauces, salad dressings, spread and baking. Radiant Wheat Leaf Powder has high concentrations of vitamins, B12, minerals and trace elements (selenium and amino acids). Rich in Vitamin A,C,E and K, that helps to improve digestion, liver functioning, build immune system, prevents tooth decay, increasing ability and energy levels. Radiant Psyllium Husk is pure high dietary fiber, composed mostly from hemicellulose, contains no sugar, sodium, cholesterol, calories or fats. Just mix 1 heaped tablespoon of powder to 237ml of water to help with bowel movements and it helps acts as stool softener. Pure Harvest Raw Honey and Radiant Wheat Leaf Powder product from Australia. Radiant Psyllium Husk product from India.